Retro Demonology is a free short story that can be read online HERE. It is a prequel to Jana Oliver's Demon Trapper's series but it is only a few pages long so don't expect too much detail. I absolutely love this series so it's one I'd highly recommend but if you're not sure about whether to start it or not then this should give you enough of a taster to decide whether you want to try Forsaken (that's the UK name, it was released as The Demon Trapper's Daughter in the US) or not. This short introduces us to Riley Blackthorn, she is the daughter of a master demon trapper and also his apprentice. This is the first time she has been send out to trap a demon on her own without her father there as back up so she is nervous but determined to do a good job. I'm not going to go into any more detail than that so you'll have to read the story for yourself but there are plenty of giggles along the way and watch out for the clever use of a child's sippy cup. Obviously Jana Oliver goes into a lot more detail with her world building in the full length novels, Riley is one of my favourite YA heroines and if you read the series you'll meet the absolutely delicious Denver Beck who I may have more than a little crush on! 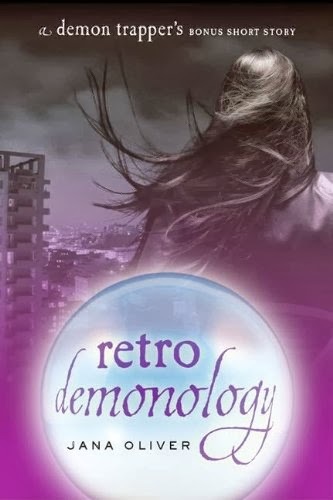 Retro Demonology is a fab little freebie from one of my favourite series and reading it has made me want to pick up Forsaken and start a re-read!